(Nanowerk News) The concentrations of toxic nitrogen oxide that are present in German cities regularly exceed the maximum permitted levels. That's now about to change, as innovative paving slabs that will help protect the environment are being introduced. Coated in titanium dioxide nanoparticles, they reduce the amount of nitrogen oxide in the air. In Germany, ambient air quality is not always as good as it might be – data from the federal environment ministry makes this all too clear. In 2009, the amounts of toxic nitrogen oxide in the atmosphere exceeded the maximum permitted levels at no fewer than 55 percent of air monitoring stations in urban areas. The ministry reports that road traffic is one of the primary sources of these emissions. In light of this fact, the Baroque city of Fulda is currently embarking on new ways to combat air pollution. Special paving slabs that will clean the air are to be laid the length of Petersberger Strasse, where recorded pollution levels topped the annual mean limit of 40 micrograms per cubic meter (µg/m3) last year. These paving slabs are coated with titanium dioxide (TiO2), which converts harmful substances such as nitrogen oxides into nitrates. Titanium dioxide is a photocatalyst; it uses sunlight to accelerate a naturallyoccurring chemical reaction, the speed of which changes with exposure to light. The "Air Clean" nitrogen oxide-reducing paving slabs were developed by F. C. Nüdling Betonelemente. Proof of their effectiveness has subsequently been provided by the Fraunhofer Institute for Molecular Biology and Applied Ecology IME in Schmallenberg, where researchers also determined the risk to the environment posed by the resulting nitrates. Their work was funded by the German Environment Foundation. Dr. Monika Herrchen, a scientist at the IME, says: "Experiments in Italian cities had already shown that photocatalytic paving slabs can improve the air quality. We wanted to see if they would also be effective here in Germany, where we have lower levels of light intensity and fewer hours of sunshine. Of course, the more intense the sunshine, the quicker the degradation of harmful substances, so our aim was to identify the formula with the highest photocatalytic efficiency rating." Initial tests in the measuring chamber conf rm that paving slabs coated with titanium dioxide can reduce ambient nitrogen oxide levels. To begin with, concrete manufacturer F.C. Nüdling produced a range of sample slabs incorporating different surfaces, colors, types of cement and TiO2 contents. Since the nitrogen oxide degradation rates achieved using standard commercial photocatalytic cement (i.e. cement that reacts to solar radiation) proved unsatisfactory, the company ultimately had to develop its own, more effective formula. "We were able to verify the effectiveness of the optimized slabs in a variety of tests," confirms Herrchen. During an extended time field test, the scientist and her team recorded nitrogen oxide degradation rates of 20 to 30 percent in specially-created street canyons. 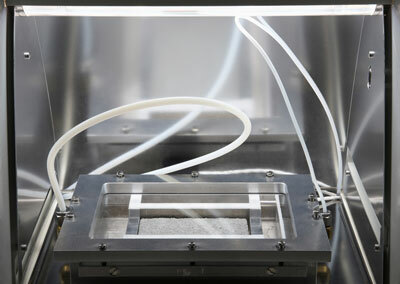 The measurements were taken at a height of three meters above the photocatalytic slabs, in variable wind and light conditions. When the wind was still, the experts recorded degradation rates as high as 70 percent for both nitrogen monoxide (NO) and nitrogen dioxide (NO2). Measurements likewise taken at a height of three meters above the Gothaer Platz in Erfurt, which is already paved with Air Clean paving slabs, revealed an average degradation rate of 20 percent for NO2 and 38 percent for NO. Herrchen points out an additional benefit of these paving slabs: "They also remain stable over the long term. Measurements recorded from 14 to 23 months after they were laid revealed no change from the initial degradation capability." Furthermore, the nitrate that is generated during the conversion process poses absolutely no risk to the environment. It runs off into the drainage system, then into a wastewater treatment plant, before finally ending up on a farmer's field or in the groundwater. The maximum possible nitrate concentration traceable back to photocatalytic reactions is around five milligrams per liter (mg/l), while the maximum permitted concentration of nitrate in groundwater is 50 mg/l. Herrchen sums up: "All in all, it's possible to say that Air Clean signifi cantly improves the air quality within a short space of time, and thus helps protect the environment."